If you are looking for a perfect vacation spot in the Midwest, the Tri-Lakes area in Branson is the place to go as it’s in this area where you can enjoy many exciting activities and thrilling water sports adventures. The three pristine lakes in Branson that include Table Rock Lake, Lake Taneycomo, and Bull Shoals Lake all offer world-class water adventures that include boating, fishing, swimming, wake boarding, scuba diving, water skiing, parasailing, kayaking, and more. These lakes in Branson all offer a world-class combination of land activities and recreational water fun adventures. The resorts and marinas in all the three lakes feature an array of boat rentals including bass boats, pontoon boats, ski boats, and wave runners. 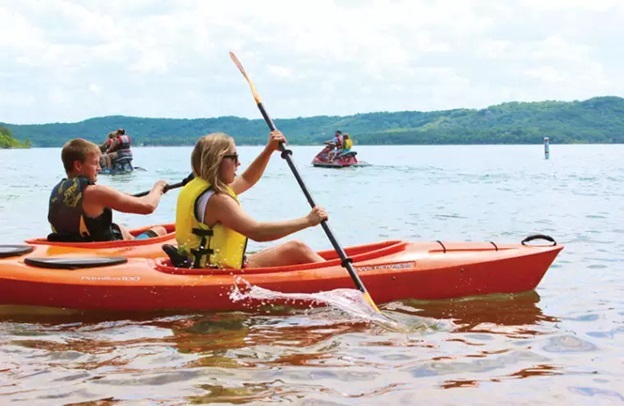 Table Rock Lake which offers 800 miles of shoreline and spanning more than 43 to 52 thousand acres, has become a favorite vacation destination for campers, boaters, fishermen and lovers of water sports of all kinds. This lake is beautifully located in the Ozark Mountain Country of southwestern Missouri near one of the world’s most popular entertainment and leisure destinations, Branson, Missouri. Table Rock Lake is also acclaimed as one of the top fishing lakes in North America as there is an abundance of bass, crappie, white bass, catfish, and bluegill. The lake has become an exciting stop for hobbyists and professionals alike because of its aggressive fish management program that help produce an impressive resurgence of largemouth, Kentucky and smallmouth bass of exceptional size. Many of the nature enthusiasts including hunters visiting Branson enjoy using the public lands that surround the lake which includes portions of the Mark Twain National Forest. Table Rock Lake features several full service marinas and over 100 privately owned resorts which supply convenient services to boaters and offer a wide variety of water related activities for visitors. The lake can be accessed from full-service marinas such as the State Park Marina, which features scores of services and boat rentals; the Port of Kimberling Marina; and the Indian Point Marina that boasts a floating café. These marinas offer boat storage and a variety of water craft rentals including ski boats, WaveRunners, pontoons, and houseboats. At State Park Marina, you can avail the service of a professional dive instructor to help you on your dives on the lake to become an open water scuba certified diver. You can also enjoy parasailing that offers eight to ten minute rides using the latest and safest technology. You can also ride with the Flyboard and have an exciting water adventure above the water. If you want to enjoy a full body workout, you can try Stand Up Paddleboarding. State Park Marina features a store that carries Table Rock apparel, aqua socks, nautical accessories, sun block, towels, batteries, bait and tackle, maps, and more. Port of Kimberling Marina is beautifully located in Stone County, approximately 15 to 20 minutes from Branson, and very near from Silver Dollar City. This marina offers boat storage and a variety of water craft rentals that include WaveRunners, ski boats, pontoons, and houseboats. They also have a floating café and boat sales. The boat storage includes both wet slips and dry storage spaces for boats of all sizes. This marina also features Coyote Dockside Café & Pub that offers cozy table dining and a handy take out service. They also offer boat cleaning service and onsite fishing guide. The Port of Kimberling features a resort that has lodging units with kitchenettes, a business center, pool, and hot tub. Several of the units include great views of the lake. The rooms feature fully equipped kitchens as well as tennis, basketball, and volleyball courts. The Indian Point Marina at Table Rock Lake also offers a wide array of water craft rentals, including tri-toons, pontoons, ski boats, deck boats, and WaveRunners. This marina has a tackle store that sells live bait, tackle, groceries, camping supplies and boating supplies that include lights, anchors, fuses, batteries, props, oil, fuel additives, line, and fire extinguishers. You’ll also find other supplies such as sunscreen, sunglasses, clothing, and snacks. Indian Point Marina also offers diving and skiing activities and the services of an experience fishing guide. The floating café offers excellent menu for breakfast, lunch, and dinner. There’s also climate-controlled dining area as well as fresh-air dining with incredible view of the lake. Lake Taneycomo is another beautiful lake in the Tri-Lakes area where its clear cold waters provide some of the finest trout fishing in the world. The rainbow and brown trout that ply the cold waters of Lake Taneycomo provide an exciting year-round fishing experience to many fishing enthusiasts around the country. From bait fishing to fly fishing and artificial-only fishing in the Trophy Trout Area near the lake’s head waters, anglers fish at Lake Taneycomo for the most coveted Rainbow and Brown Trout rewarding experience. Lake Taneycomo was a “warm water” lake from 1913 until 1958, but when Table Rock Dam started feeding the lake, the water coming from the dam was significantly lower in temperature and it created a “cold water” on Lake Taneycomo. Missouri Departmentment of Conservation took this advantage and constructed the “Shepherd of the Hills Trout Hatchery” at the foot of the dam. The cold water at Lake Taneycomo Mile Marker 22, located near the Table Rock Dam, averages 48 degree F, resembles a river and permits wading and bank fishing for trout. The water gets warmer as the lake sinks to depths in excess of 50 feet near Lake Taneycomo Mile Marker 1 and the Power Site Dam in Forsyth. When power is generated by Table Rock Dam its current is very strong throughout its whole length, the water temperature on the lake drops, and for all practical purposes it becomes very deep, cold, fast running water. Bull Shoals Lake is governed by the U.S. Army Corps of Engineers. It spans 45,000 acres and has nearly one-thousand miles of shoreline surrounded by deep forests. Nestled in north central Arkansas and southwestern Missouri, Bull Shoals Lake is one of the beautiful lakes in Branson that offers recreational activities and exciting water sports adventures. This lake was created when the construction of the Bull Shoals Dam was completed in 1952. The dam was constructed to produce hydroelectric power and to help control the flooding in the White River basin. Bull Shoals Lake has gained wide recognition as a prime fishery in the Midwest. The lake boasts several Missouri and Arkansas state angling records. It is home to many species, ranging from largemouth and stripped bass to walleye. The downstream of Bull Shoals Dam, White River is the premier trout fishery in the central United States that has yielded Arkansas state records for rainbow trout and cutthroat. There are about nineteen developed parks around the lake that offer facilities including pavilions, campgrounds, picnic sites, docks and boat launches, swimming areas and commercial marinas offering boat and equipment rentals, fishing supplies, gears, tackles, and fishing guide services. Visitors from across the country come to Bull Shoals Lake to enjoy the clear waters of the lake and have fun with tube floating, water skiing, sail boating, wake boarding, scuba diving, and top-rated fishing. As you can see, it’s easy to access the lakes in Branson and discover a variety of exciting water activities in the Tri-lakes area. Whether you’re fishing, boating along the water, or para-sailing above it, there’s nearly endless list of ways to enjoy fun activities on the lake.